These red, white, and blue Lemon Blueberry Cherry Muffins are perfect for the 4th of July, but they are so tasty you will want to serve them all year long! Do you have any fun 4th of July plans for this weekend? We are heading to my sister’s house in Idaho. She’s lived there for three years and this will be our first visit. It’s about time, don’t you think? 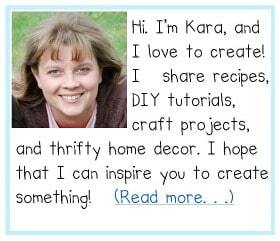 I am so excited to hang out with her. My boys are excited to play with their cousins too. On the way up we are stopping at my husband’s sister’s house, and on the way down we are stopping at my baby sister’s house. It will be a jam packed, but fun weekend full of family, food, and festivities. 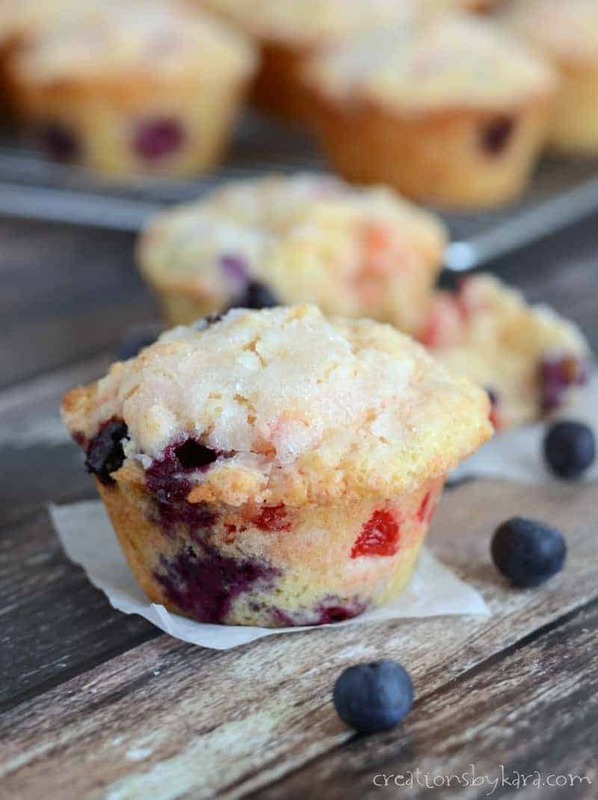 If pancakes aren’t your thing, you should try these cherry muffins for your 4th of July breakfast. 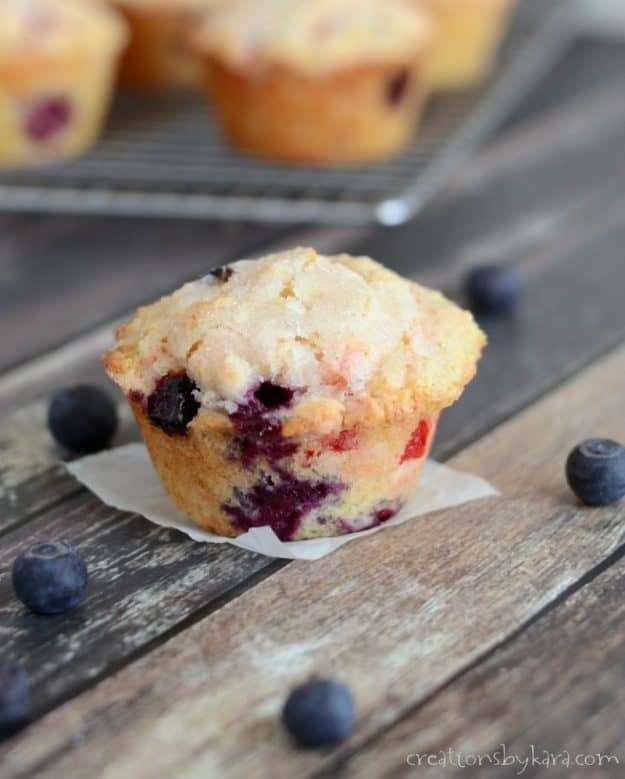 I got the inspiration for these blueberry cherry muffins from Prudence Pennywise. I just made a few changes to make them a little healthier, and added the cherries to give them a patriotic flair. I LOVED these muffins. I think that they are my new favorite. 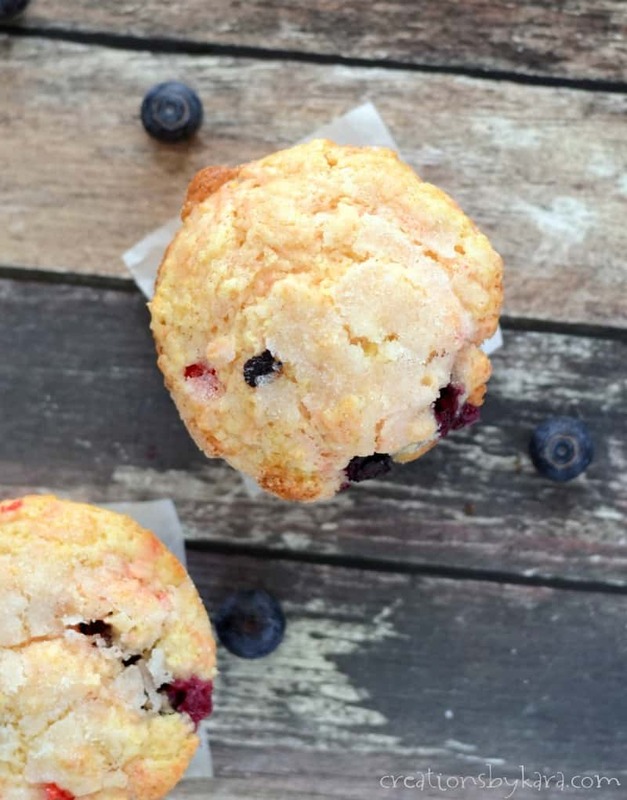 I love lemon and blueberry together, but the addition of cherries made them extra yummy! Make sure you add the berries very gently or they will turn the whole batter blue and ruin the whole “red, white, and blue” thing. 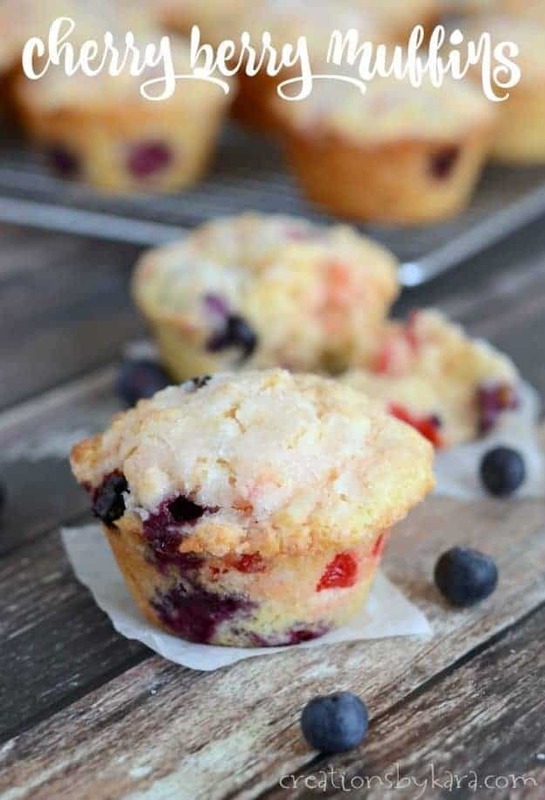 Lemon muffins with blueberries and cherries, topped with sugar. Whisk together dry ingredients in a large mixing bowl. In separate bowl, whisk sour cream, eggs, vanilla, butter, and lemon zest & juice. Stir gently into dry ingredients till barely combined. Fold in berries and cherries. 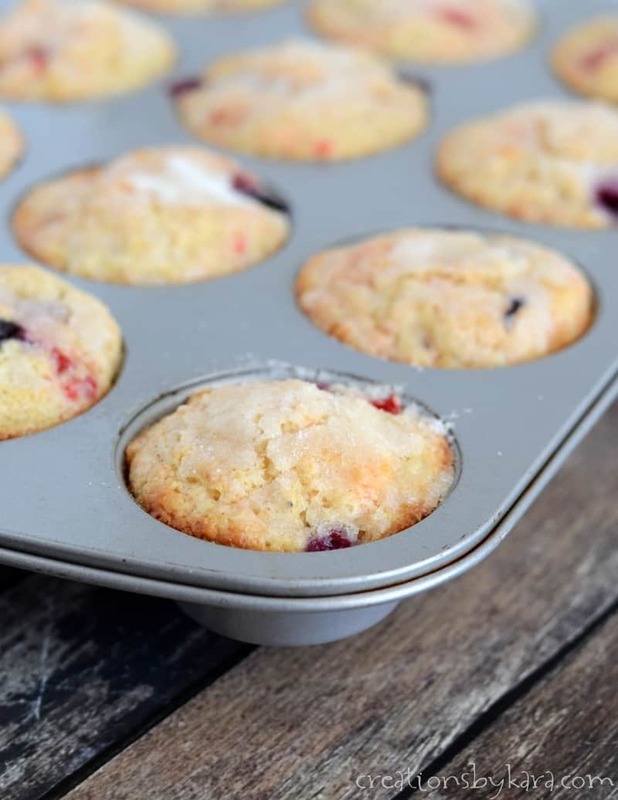 Spoon into greased or paper lined muffin tins. 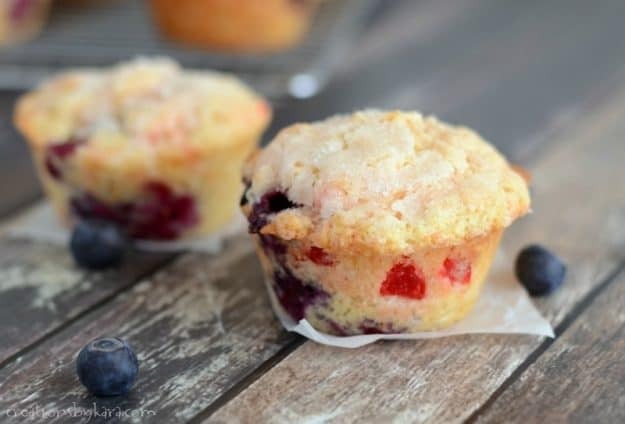 Sprinkle sugar on the tops of muffins. Bake at 350° for about 15-18 minutes. You could replace the butter with margarine or coconut oil, but I don’t know of a dairy free substitute for sour cream. Hopefully one of my readers has a suggestion. BEST MUFFINS EVER!!!!!! Thank you for the recipe! !